How does one invent the personal computer as we see and use it today? Start early in life with a father who has knowledge of and access to computer and electronics parts. Be interested in the cutting edge and being first. Spend years designing and “building” things on paper because you have no money. Don’t be obsessed with money – be more obsessed with having fun. Challenge yourself to iterate and improve your designs. Make friends with people who compliment your abilities. Be willing to do things for the lulz and without compensation. 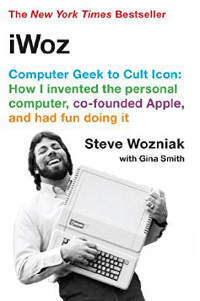 Steve Wozniak has an interesting story and obviously lots of insight on the beginnings of the personal computer and the early history of Apple. His autobiography definitely sounds like the Woz: straight-forward declarations of the great or funny things he’s done, exclamations of his own motivations, and energetic invitations for others to similarly create.